First off, a note of apology. It’s been months since I’ve posed here. Not for lack of desire – more about some combination of crazy busyness and lack of proper prioritization. I miss it and am going to try to step it up. 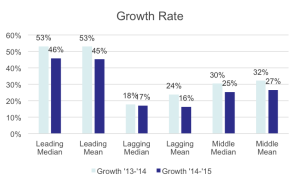 This is a post about the importance of growth, about the current market environment and a note of caution if the growth imperative changes rapidly to the profitability imperative. A few months ago we held a “SaaS Summit” for about 130 people from across the Foundry Group portfolio. It was a great chance to compare notes, meet far flung colleagues (“cousins” as we sometimes refer to employees at different portfolio companies) and discuss a variety of topics effecting companies selling with a recurring revenue model. As the organizer of the event I pulled together the morning briefing to kick things off – basically a bunch of data from a variety of different sources talking about the state of the SaaS markets. There was some juicy stuff in there, but one set of facts clearly stood above the rest. 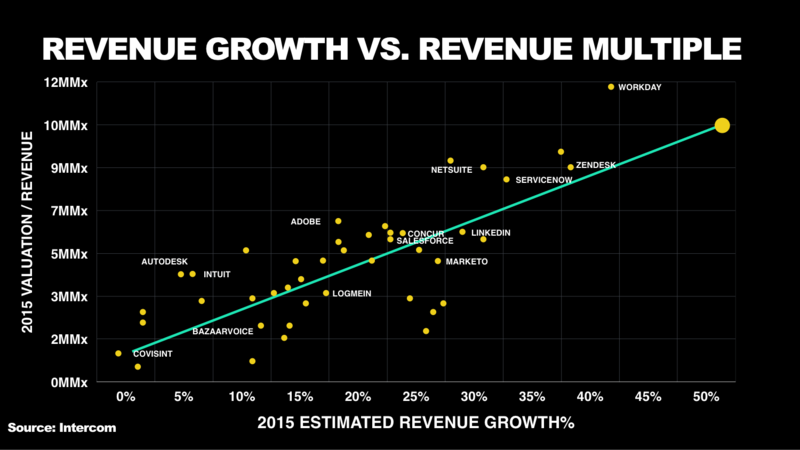 At the moment, growth is THE single most important factor when considering the value of a SaaS company. Let’s start with some data and then we’ll parse through what it means. The data below are a mix of things I came up with as well as a some key data points borrowed from my friends at FirstMark, who undertook an extensive analysis of the SaaS market. The full methodology here isn’t worth stepping through in detail, but essentially what the study did was try to separate companies into “leading”, “lagging” and “middle” SaaS companies. This was a reflection of their trading behavior, not an assessment of their underlying business (i.e., we relied on the market for the determination of leading vs. lagging). It’s important to note that there weren’t material differences in revenue size, geography, target market, etc. between these companies. First the cold hard trading facts. “Leading” companies trade at significantly higher multiples than their peers. No huge surprise there – that’s pretty much the definition (in this study) for a “leading” company. But helpful to show the stark difference. So what causes this massive difference? We looked at a bunch of different factors, but as I give away above, the single most important factor for valuation of a SaaS business is growth. The “growth effect” was highly statistically significant. In fact, a 10% (meaning 30% to 40%) increase in growth rate translated into a 3x (3x!!) 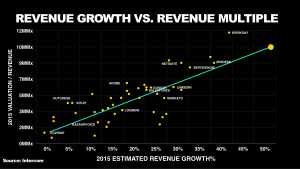 increase in revenue multiple. That’s highly significant. And interestingly if you look at factors such as Gross Margin and EBITDA Margin they weren’t predictive at all. 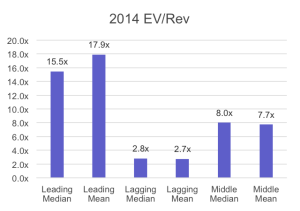 Nor was recurring revenue (meaning the % of revenue that was recurring vs. services). Below is another graph looking at the core correlation between growth and multiple (simply another way of showing the results I discuss above). If I’d been on the ball a few months ago and posted these data back then, this would have been the end of the story. Markets value growth and growth above everything else (at least at the time). But, of course, the markets have changed since then and it’s important to note a few things because of this. I have another post I’m working on describing why I don’t think we’re in a “bubble”. But even if that’s true, it doesn’t mean that the markets won’t go down, and more importantly for many of the people reading this, that the private markets won’t start shifting their focus from growth to other factors (i.e., profitability). We’re already seeing this in some markets such as security. And we’ve certainly seen in the past that when the markets shift their focus from growth to profitability they do so pretty quickly (briefly in 2011, before that in 2008 and dramatically in 2000/2001). Unlike some, I don’t actually have a view on how drastic a correction we’re headed into (as I said at the start of this paragraph, I don’t think we’re in a bubble to begin with, but we’re clearly experiencing turbulence, nonetheless; however the sky isn’t falling and I tend to agree with what my partner Brad Feld said in the article linked at the beginning of this sentence: “I think everyone will have an opinion and no one will have any real idea,”). Much more on this in my bubble post upcoming, but I didn’t want anyone walking away from this note saying “Seth says grow at all costs!” I’m saying the markets are valuing growth to a degree that surprised me when I looked at the numbers, BUT that one should take that with a grain of salt given the current market conditions and the tendency for markets to quickly shift their focus. Smart growth is the right strategy (I said this months ago at our Summit as well). The best businesses are sustainable and grow at a pace and in a manner that sets their burn rate at an appropriate level relative to their funding and matching things like CAC to LTV in sustainable ways.